The 2018 Omaha Maverick baseball season will begin this weekend in Arizona with a four-game series against Northwestern of the Big Ten. Last season was one to forget for the Mavericks, who finished 12-40 (9-19 Summit League) and the program was picked to finish fifth in the six-team conference last week. The Mavericks will have nowhere to go but up this season under second-year Head Coach Evan Porter. 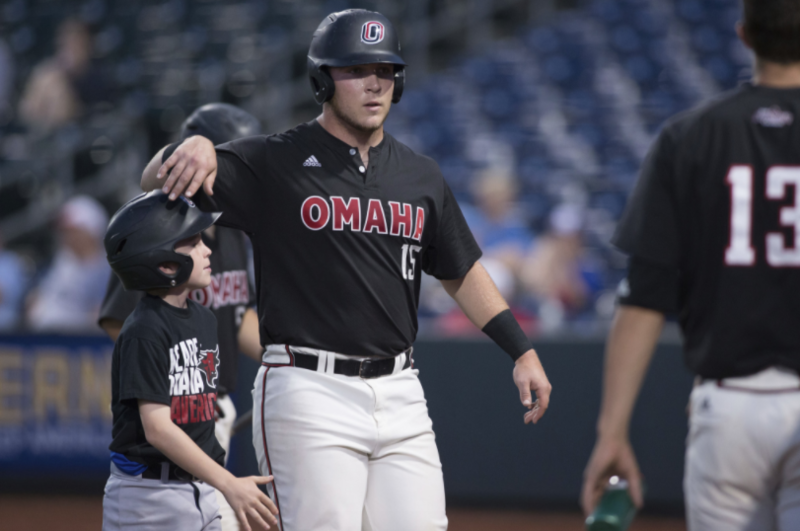 Omaha loses a pair of starting pitchers in Sam Murphy and Corey Binger who saw a significant amount of innings last season, 26 starts and 140 and a third to be exact. Suponchick was the only returning player on the Mavs roster that had more than five starts on the mound last season. Cal Hehnke and Payton Kinney saw most innings on the mound in relief. Hehnke finished with a 5.50 ERA over 34.1 innings and Kinney had a team-high 3.88 ERA over 51 innings pitched. Kinney may have an opportunity to be a part of the team’s starting rotation, but Porter will have a lot of kinks to work out in the coming month to solidify a competitive pitching game that was absent a year ago. Thibodeau, Kalina, Smejkal and Caniglia, the senior leader for the Mavs this season, will be expected to carry the offensive load. Thibodeau and Smejkal are both reliable at the plate while Caniglia led the team in triples last season. Kalina hit 11 doubles a season ago which can make for an interesting duo in the middle of the lineup paired with Caniglia. The Mavericks will look to improve their out-of-conference record from a year ago in the month leading up to Summit League play, but here’s how the rest of the conference stacks up before the season begins. ORU absolutely dominated league play last season en route to a 1-2 outing in the NCAA Regionals. The Golden Eagles are the obvious pick to repeat as Summit League champs in 2018 with the returning Conference Coach of the Year Ryan Folmar in his sixth season at the helm in Tulsa. ORU has dominated since returning to the Summit League in 2015 with back-to-back regular season titles and a third last year. The Golden Eagles had 10 players earn first-team Summit League honors last season and three more earn spots on the second-team. Seven first-teamers and one second-teamer will be back again this year. There wasn’t another Summit League team that had more than four players earn All-League honors. ORU also swept the league awards last season with a Golden Eagle winning Conference Newcomer of the Year (Dylan Snypes), Pitcher of the Year (Ausua), Coach of the Year (Folmer) and Noah Cummings will look to repeat as the Summit League’s Player of the Year. Ausua, McMinn (a 36th round draft pick for the Minnesota Twins) and McGregor were the top three pitchers, ERA-wise, in the Summit League last year and all return. The Jackrabbits were responsible for one of ORU’s four losses in conference play last season and will be returning a pair of key bats and a starting pitcher that may give them an edge this season. Kjolsing and Johnson earned second-team all-conference honors a year ago. Johnson knocked in 40 RBIs last season and was tied for third in the Summit League with teammate Matt Johnson, who graduated. Logan Busch had 57 hits last season and accumulated a .303 average at the plate and will be back this year. The Bison beat ORU twice before losing the third game of the weekend in a home series last May. The Bison lost three pitchers who played a lot of innings last season including Reed Pfannenstein, who led the Summit League with 93 innings pitched last year. The Bison also lost RHP Luke Lind, who led the conference in strikeouts last year with 92. Junior Ian Koch will be the Leathernecks ace this season after going 5-5 in 15 starts last season over 87 innings of work. That experience will no doubt come in handy this season. This could be the surprise team besides NDSU and SDSU with a chance to unseat ORU of their Summit League reign. WIU also brings back some generous bats in Fleek and Galassi who had a combined 59 RBIs last year. The Leathernecks will also have Mitch Ellis, a reliable man at the plate, who only struck out six times in 171 at-bats. The Mastodons will be looking to break the 10-win mark this season led by a pair of redshirt seniors. Brock Logan hit six homeruns last year, which tied for eighth in the conference. Baker had an on-base-percentage (OBP) of .387 last year and will be able to give Fort Wayne some runs when needed, but the most important void the Mastodons will need to fill to be competitive, just like the Mavs, will be finding a solid pitching staff.